Mustafa Kemal Atatürk - founder & first president of Turkey! 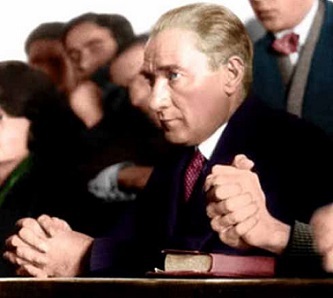 Since Mustafa Kemal Atatürk (1881-1938) lived quite a while ago, there are probably very few high quality photos available of his hands (if there are any). Re: Mustafa Kemal Atatürk - founder & first president of Turkey! Although Atatürk lived some time ago, there are many good portrait photos available, thanks for finding some that show his hands! My friend, an academic at Istanbul University, is also looking. Thank you Martjin, the very earthy hand that shows the first foto reminds me on that of Ariel Sharon.